I'm taking my family out on the town tonight. Well, actually, we're driving down to Green Cove Springs. We're going to watch the new Indiana Jones movie at the Clay Theatre. I've read a lot of reviews about this film. Some critics love it, others hate it. Some don't like it but obviously feel guilty writing a bad review of Indy. I loved the first three movies, though I must say the Temple of Doom was my least favorite. There's just something about the music. . . .Da de da da. . . and you feel like it's 1981 again when Harrison Ford first donned the fedora. So, here's my question. Have you seen the new film? If so, what do you think? This is the final message in the "Discovering Why We're Here" series. The fact is that we grow together and show that we love God more when we serve each other an serve together. 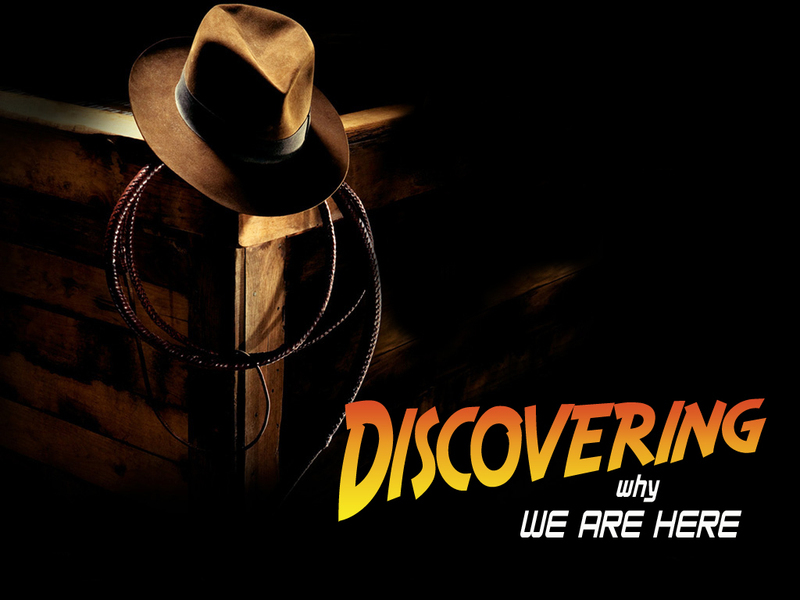 This is the fourth sermon in our series titled "Discovering Why We're Here?" This message gets to the reality of why it's so hard to commit to a small group. Yet, we believe that for spiritual health, everyone needs to be an active part of a small group of believers. In preparation for a retreat to Colorado, I was told to read the book by Mark Buchanan, Your God is Too Safe. You can purchase this book from the online store accessible through this blog. Anyway, Buchanan is a pastor in the northwest. I'm about halfway through, but have found myself sharing thoughts and ideas from this book to others through conversation, counseling sessions and even in my sermons. Buchanan talks of "borderland." This is a kind of no man's land between countries. He references an area between Kenya and Uganda. It's an area that's in dispute between countries based on old tribal disputes and is about 100 yards wide. It's frightening because there is no law there. However, it's also safe, because it's always the same. Therefore, many people live there. That parallels many Christians' spiritual lives. They have chosen to live in "borderland." The author references a man in his church who said he's been a Christian for 28 years and still doesn't know what God is calling him to do. That's borderland and it stinks. To live there is to waste one's life. Here's a great quote from the book that really resonates with me. . .
"The worst consequence of losing our imagination, our wonder, is that we no longer see the Christward life as an adventure. We see it as a duty, a chore, a list o dos, don'ts, and how-tos. We think borderland is not a bad place to live. The stories we read in Acts about the church "turning the world on its head" (Acts 17:6) - well, what would that kind of thing do to our tax-exempt status? My desire is to lead our church out of borderland. I fear too many are satisfied with the safe God they've created who lives there. What a waste. In our series of Discovering Why We're Here, this message focuses on how as the church we are to reach out together. This is the first of a new series of teachings focusing on why we are here as a church. Some material was taken from Rick Warren's "40 Days of Community." Community is what God has placed us here for - to reach the community for Him and to become community as a church. This information was taken from the local newspaper in Paris, Tennessee, the Paris Post-Intelligencer. It's an editorial written by my dad, Jack Tarkington. More and more people of my generation approach this day each year for the first time without their mother's physical presence. For some of us it has now been several of these annual days of recognition without our mother, and others are still blessed to have their mother around. I fall in that second category. Even though it has been almost seven years since I lost my mother, that void is, and always will be, in my life. I dare say this is true for most people. Your mother will always be special. She is your advocate, supporter, defender, teacher and friend. And while she may not approve of some of the things you say or do, she will always love you. My mother never gained great fame or fortune. She never graduated from high school. Her passion was her family. She was content to be a faithful and loving wife to my dad for almost 55 years, a dedicated homemaker, a dedicated friend to all she knew and a surrogate grandmother to many. When I was eight years old, she started baby-sitting two-year-old Geralda Holley, and continued doing so for about six or seven years. Over a period of time, she also baby-sat Bobby Boyd, Jared and Ashley Veazey, and in later years, her great-nephew Cameron Cooper. For several years in the 1970s and 1980s she "baby-sat" Steve and Sherrill Olver. Baby-sitting is probably no the correct term for them, since they were in school and would stay with her each day after school until their parents got off work and came to get them. She grew to love them and took great pride in their achievements. She truly became their surrogate grandmother. I truly came to realize this a few weeks after her funeral, when I received a card and letter from Steve expressing this to me. Steve stated the letter had been several weeks in the making, expressed his sympathy, and said he hoped he could someday show the same love, care and devotion to a child of his own she had shown to him. Be nice to your little brother or sister. They may grow up to be just as big as you are one day. Go to Sunday School and Vacation Bible School. Not only will you learn about Jesus, but the Kool-Aid is good. Use a black skillet to fry potatoes (or almost anything else.) It will always taste better. Don't skip a page when reading a book to a child. They usually know the difference, and you never know what you'll miss. At the end of a rough day at school, it is always a good idea to sit on the front porch in the swing and let someone else help you with your problems. Quiltin's and hog killin's always mean good food, lots of neighbors and tall tales. Play with the neighbor, and let her choose what game to play today. You can choose tomorrow. I will keep Steve's letter, but more than that, I will keep those simple life lessons. I am sure Steve doesn't mind me sharing them with others. As Mother's Day approaches, remember Bear Bryant's line in a telephone commercial several years ago, "Be sure and call your your Mama. I wish I could call mine." Great article, Dad. Grandma was all this and more. We are planning and preparing for our next men and boys' getaway. This year's Battle Ready event takes place August 29 - September 1 at Horn's Creek, Tennessee. Go to www.realmanhood.org to register. The new film "Fireproof" opens later this year. It's by the makers of "Facing the Giants." Warren Barfield's song "Love is Not a Fight" has been chosen for the movie soundtrack. This is a powerful song and the video from the movie site is strong. Click below to watch the video. It's worth it. Fireproof Video "Love Is Not a Fight"